In Destiny: Destiny The Taken King, the coins are more valuable than ever, because you may be able to trade with merchants Xur against three of the coins with which you have a better chance of exotic loot. In our guide we'll show how to farm Strange Coins quickly. Whether PvE or PvP raids, with the bounties it assures you a constant supply of Strange coins. In PvP you also have a chance to earn strange coins at the end of each round 1-3. If you forays Autogespot, you also get a random amount of coins and engrams. In addition, you enhance the reputation with retailers and your respective faction, which give you at rank-rise an item package by each guaranteed 5 Strange coins. Also Strikes are very rich sources of coins and other stuff (rare, legendary, or even exotic engrams), which you can get from the Cryptarch in the tower. Here you have the chance of strange coins while increasing your reputation. For rank-rise you'll get a legendary item package with 5 strange coins. 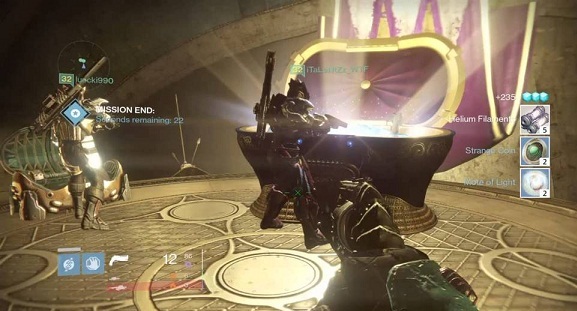 If you want to get hold of strange coins quickly, a visit to the Prison Of Elders on the reef is recommended. You need any players to matchmaking and can choose the easiest difficulty. There is a treasure house with two small and a large chest. Pro box you get 2-3 Strange coins. The Dreadnaught Ship of Oryx is a new field in Destiny: The Taken King, and in the gloomy ship there are massive chests that often spit out five coins. In addition, you can also farms Hadium Flakes easily in this way for that you need to get a sword.